The Rolls-Royce Owners’ Club (RROC) launched its very first members’ yearbook last week at Seven Springs Mountain Resort, Pennsylvania. 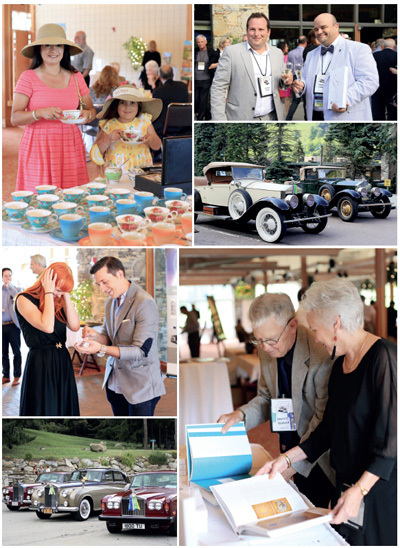 More than 800 members of the club were gathered at the resort from July 28 to August 2 for the club’s 63rd Annual Meet, and all were invited to join UK publisher St James’s House in celebrating the publication launch and award ceremony. The hardback publication Rolls-Royce: A Legacy of Driving Excellenceexplores the foundations and history of the world’s most famous marque. Published by St James’s House and written by experts and enthusiasts, the book also features leading companies from around the world. The yearbook is 272 pages long and distributed as a privately produced gift to all 10,000 members of the RROC around the world. In addition, 12,000 copies are made available to all Bentley and Rolls-Royce dealerships on a complimentary basis. The launch event featured a very British afternoon tea and champagne reception - a fitting nod to the heritage and history of the English marques. Guests at the launch event also had the opportunity to view some of the finest examples of vintage Rolls-Royce and Bentley vehicles during the Club’s Senior Awards ceremony. St James’s House is a leading custom publisher based in London.